Sometimes you just need a cosmically-attuned Albert Einstein to come in and straighten everything out. Does he still count as Cosmic Albert Einstein when the next writer to try to straighten out the scramble decides that he was really a Guardian of the Universe? 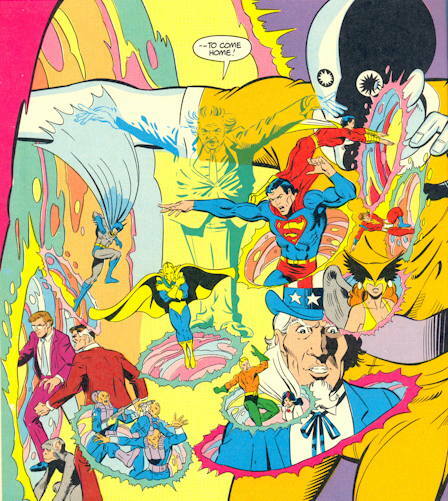 As soon as I saw those colors – or rather, felt them burning into my eyes – I knew it was an issue of DC Challenge. I don’t care who you are, DC Challenge was awesome. If this new DC Comics Presents line is going to fly, this is the kind of project they should be reprinting. OK, we both mentioned Albert Einstein in our blogs today; that’s just plain weird. Or scary. Like Old Bull Lee, I had my childhood memories snapped into focus by those sharp, sharp colors. The DC Challenge was kinda the last hurrah of the Silver Age, in a way, bless it. Man, I’d love to see another one of these. As long as they followed a strict no decapitations/dismemberments rule, at any rate. I’d love to see what sort of hot bag of crazy Gail Simone might pass to Brian Azzarello. Time Portals are sure way to win me over. I want it! 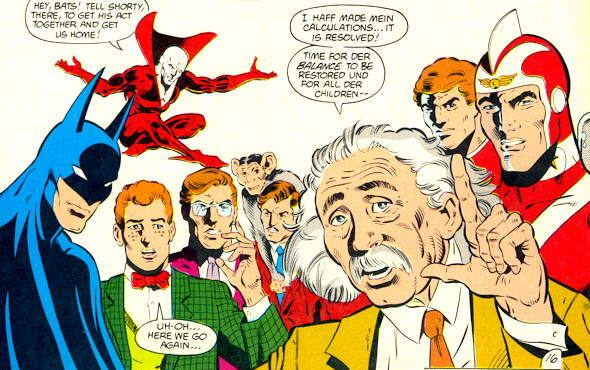 Is that Jimmy Olsen, the young man who was once a giant turtle, giving attitude to Albert Einstein? Jimmy was MARCO POLO, and Nixon’s go-to man for Nixon when it came to black ops. He’s got a big history when it comes to the exchange of attitude, what I’m saying.